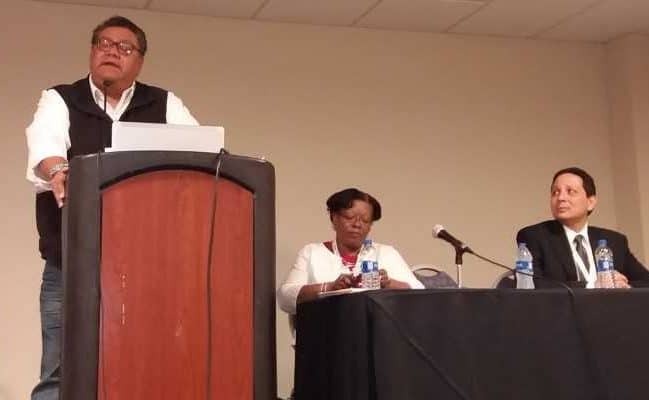 From left, Milton Bluehouse Jr., Cassandra Allen, and Corey Garza present “Environmental Justice @ Your Library and in Your Community,” a September 29 session at the third National Conference of Librarians of Color in Albuquerque, New Mexico. Environmental justice affects everyone—and, according to a landmark 1971 Council on Environmental Quality report, it affects racial minorities and the urban poor more adversely. 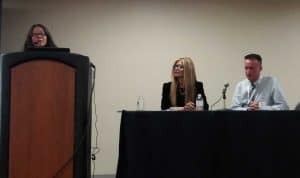 “We are all familiar with what happened in Flint,” said Cassandra Allen, outreach librarian at the National Library of Medicine. So what part can libraries, universities, and other organizations play in making sure people of all races, cultures, and income levels are treated fairly when it comes to environmental development, implementation, and policy? 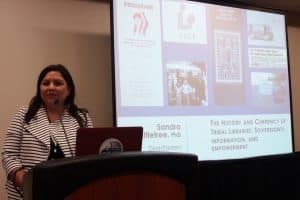 At “Environmental Justice @ Your Library and in Your Community,” a September 29 session at the third National Conference of Librarians of Color in Albuquerque, New Mexico, a consultant, a scientist, and a librarian came together to offer ideas for environmental justice advocacy. For Milton Bluehouse Jr., a consultant, lawyer, and member of Navajo Nation who comes from a long line of healers and activists (“You know that gadfly who shows up and disrupts the meeting? That’s my mom”), environmental justice within a tribal context is a conversation that must presuppose a generalized definition of the term. “The definition of who a healthy person is is quite complex. Who is a healthy person from an indigenous definition?” Bluehouse asked. He said that personal connections to family relations, understanding your place in the universe, not being exposed to toxic chemicals from mining, and having access to mountains, medicinal plants, clean drinking water, and healthy food are some context-specific indicators of health. Bluehouse also said that in his community, environmental justice is part of a model that includes cultural justice, social justice, and economic justice working in concert. Corey Garza, associate professor of marine science at California State University Monterey Bay (CSUMB), sees diversifying the hard sciences as means to closing the environmental justice gap. “You have to get your information out there and really push what you’re doing,” said Garza, who is involved with SACNAS, a group that aims to support Chicanos/Hispanics and Native Americans in pursuing advanced degrees and leadership positions in STEM fields, and runs a 10-week Research Experiences for Undergraduates program at CSUMB to expose students to ocean science research. Allen capped the program by presenting on behalf of environmental engineer Pamela Bingham and her own library a list of resources and approaches that librarians can use in their pursuit of environmental justice, such as the National Library of Medicine’s TOXNET database, diverse children’s books about the environment, mapping tools, community gardens, bibliographies, film screenings, and giving the public easy access to environmental documents. For more resources, visit nlm.nih.gov.